We thought we would add this category in at the very end to give you some ideas of some handmade and DIY options that are simple, cost effective and meet a variety of personality types. Here are some ideas to cover teachers, kris kringle work colleague gifts, kindy and school friends. 7. Reindeer food DIY – these are a great option for the kindy/school friend. There are loads of tutorials around and yes, we’ve all seen it on Pinterest but I like this one by Milk Please Mum here who had her little one write her name on the tags. We made these last year and my Mr 5 loved putting them together. GIVEAWAY: My gorgeous co-author woud love to make one of our lovely blog readers a travel zippered pouch in their choice of fabric. Leave a comment here or on Cat’s blog. One person will be chosen at random on Saturday 30 November in the evening (HK time) and she is happy to post anywhere in the world. Also, see yesterday’s post for my giveaway! Thank you all so much for your lovely feedback on Facebook and Instagram in particular about our series, we’ve really enjoyed sharing our finds and love of the homemade and handmade with you. This entry was posted in christmas, creative stuff, etsy and tagged home, home decor, interior, interior decorating, interior design, interiors, Moleskine, polyvore on November 28, 2013 by catbeloverly. Today we’ve put together some ideas for some of the most important people in our lives – our Mum’s, Grandma’s and Mother-in-laws. I know our world wouldn’t be so rich with my Mama and Grandma’s very real presence in it. I love to spoil them on their birthdays and Christmas. 2. One of my stitched children’s artwork pieces, starting at $40 AUD – my etsy store is here …. also, I’m giving one of these away …. see below for details! 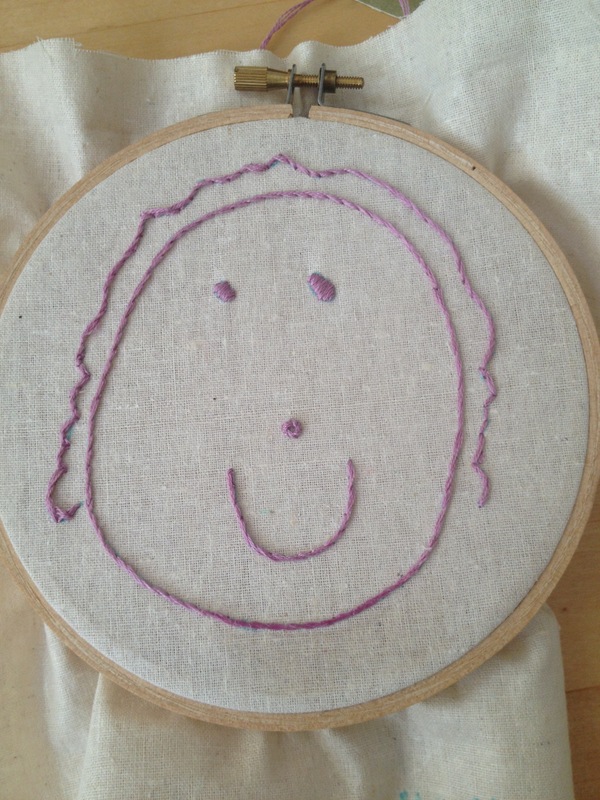 GIVEAWAY: I’d love to stitch a little portrait for a special gift! I’ve taken to these small portraits set in 15cm hoops and I’d love to stitch one for one of you! If you’d like to win, please just comment below telling me what either you, or your child loves to draw most! Entries are open to international entrants and will close on Friday evening, the 29th of November 2013. The winner will be drawn at random. This entry was posted in christmas, creative stuff, etsy and tagged home, home decor, interior, interior decorating, interior design, interiors, polyvore on November 27, 2013 by catbeloverly. Teenage girls are so fun to buy for! We’ve included a variety of ideas in this guide to cover young teens through to older teens. 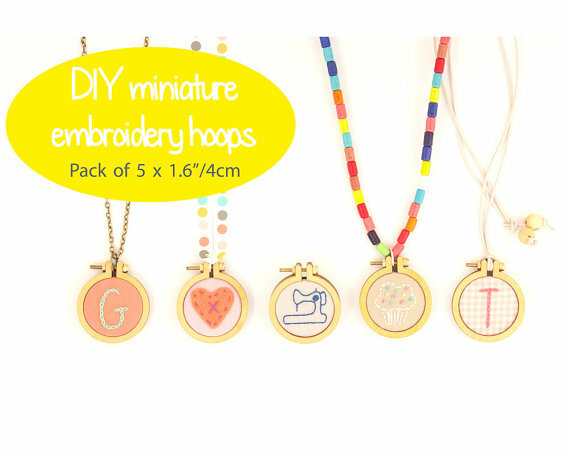 1, DIY Miniature Embroidery Hoop by Dandelyne – $19 AUD. Sonia from Dandelyne is one cool and clever chica. Her stitched pieces are divine and feature heavily in my personal wardrobe and I’ve gifted a LOT of her pieces now. This little kit is a fairly new addition to Son’s etsy shop here and mean that you can create and stitch a design of your own. Ace! And now to our GIVEAWAY…cue the trumpets! Sonia from Dandelyne has offered up two of her five packs of DIY necklace kits (you can see them here) to a couple of VERY lucky people! Each pack retails at $45 AUD! One kit will be given away via blog comments and another on instagram. To win via the blog all you need to do is comment on either of our posts saying which item you’ve liked most in our series to date. Winners will be picked at random at the evening of Friday November 22nd. International entries are most welcome. For details of our instagram giveaway check our profiles later today – you can find me at @cat_beloverly and Cat at @raspberryrainbow GOOD LUCK! This entry was posted in christmas, creative stuff, etsy, giveaway and tagged home, home decor, interior, interior decorating, interior design, interiors, polyvore on November 19, 2013 by catbeloverly. Today’s gift guide is all about teenage boys, a category notoriously difficult to buy for …. because there are only so many video games (do they still call them video games?) a young man needs surely!! Our ideas embrace the quirky, geeky and we have two awesome DIY options too. 5. DIY Option – an Ice Cream Care package + online movie voucher of your choice. This idea is from The Misadventurous Maker (see her original post here) and also appeared on Fat Mum Slim here – cost is up to you as to how fancy you make it. 6. A DIY gadget cover tutorial via Curlypops here – I would be very surprised if a teenage boy didn’t have a gadget of some type! Have you got a teen boy to buy for? What are they in to? This entry was posted in christmas, creative stuff, etsy, food and tagged home, home decor, interior, interior decorating, interior design, interiors, polyvore on November 18, 2013 by catbeloverly. Today in our series Cat and I are sharing some ideas of what to give the little men in our lives….I may know a thing or two about little boys and my boys have several of these already and love them! My little boys are creative players, puzzle do-ers, collectors and avid readers and our list reflects the kinds of things they love doing. Handmade soft toy superhero “Edwin” by Tiny Morsels Emporium $24.16AUD – etsy store here Someone better snap this one-of-a-kind up before I do!!!! He’s adorable. DIY Tutorial: Circus Paper City by Made by Joel – free! – blog here We have used a number of Joel’s tutorials now and they are all great. You could make a beautifully presented gift by pasting on to thicker card stock and presenting in a lovely tin. Special offer: As a special offer today Jacqui from Mee a Bee has offered free shipping for anyone who wants to order a bag from her store. I have gifted every small person in my life one of Jacqui’s bags and they are brilliant. To claim this offer just enter: BELOVERLY at the checkout. This entry was posted in christmas, cool people, creative stuff, etsy, kids craft and tagged home, home decor, interior, interior decorating, interior design, interiors on November 14, 2013 by catbeloverly. Welcome to the first in a co-authored series of blog posts by Cat from Raspberry Rainbow and me. Our series of guides focuses on handmade, homemade, local and also includes some DIY tutorials. Over the coming days we will have some little surprises for you so stay tuned! On Day 1 we give to you our guide for babies featuring some of our favourite makers and generally clever clogs’. It seems it’s been influenced by my love for clouds but there are some gorgeous pieces to suit any budget here. We also have a special offer for you below! Special Offer: The lovely folks at Little Sapling Toys are offering a 10% discount on any toys purchased in their etsy store. To redeem just enter the code LOVELY10 at the checkout. Do you have anything on your wishlist for babies that we need to know about? Have you started your Christmas shopping yet? For the first time in years I haven’t!!! This entry was posted in baby products, christmas, cool people, creative stuff, etsy and tagged home, home decor, interior, interior decorating, interior design, interiors, polyvore on November 12, 2013 by catbeloverly.